Listen. What does Anna do at these times? 2) We leave for London on... of January. 3) My watch is... minutes fast. 1) seven, 2) eleven, 3) a hundred, 4) eighteen, 5) second, 6) seventy, 7) twenty-five, 8) three. 2)... is a garden near a house. 4) Is... a library in your school? 1) I'm looking... my textbook which I left here. 2) It's getting dark, will you turn... the light, please. 3) I saw him playing football... that time. 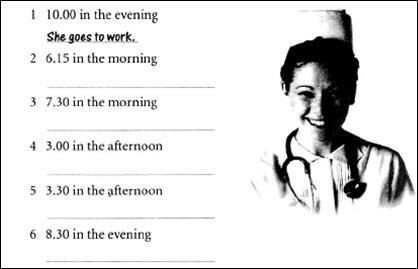 Which of the sentences are true? 2) The "Forsyte Saga" was written by Galsworthy. 3) The British flag is called Union Jack. 4) New York is the capital of the USA. 5) Portugal is situated in Latin America. 6) Swedish is spoken in Switzerland. The sky is bright. The sun gets warmer. It hardly ever rains. There is fresh. Green leaves appear on the trees and some flowers break blossom. The nature awakens after a long sleep. It is situated in Western Europe. It borders on France. The head of the country is the King. Picasso was born in this country. 1) writer, 2) builder, 3) teacher, 4) worker, 5) driver, 6) pilot, 7) lawyer, 8) painter, 9) dancer, 10) singer. Foreigners often say that in English trains people never speak to each other. But this of course is not true. Not long ago I was travelling to London. In my compartment there were many passengers and they talked to each other almost all the time. They told each other where they lived, where they were going and, of course, talked about the weather. As soon as the train started a little girl sitting by the window, called out:" We're off'. I found out that she was going to her aunt's in Chiswick. It's somewhere near the Thames but I don't know exactly where." Shall we be passing anywhere near it?" "Chiswick? That's easy to find. You can get to it on the Tube. I'll show you where to go when we arrive", I told her. "Goodness, how fast the train is going!" said an old lady. " Do they go so fast in snowy weather and at night?" Her neighbour smiled, took out a book and began to read. Here was a typical Englishman: during the whole journey he didn't say a single word. But as we arrived in London, he got up and turning to the lady he said with a strong accent:" Excuse me. I do not understand English. I am from Poland." What nationality was the man taken for a typical Englishman? 1) "Well", said the farmer, "I'll tell you what we do." 2) The man went back to his car greatly surprised and said to his wife, "I think he must be crazy." 3) "We eat what we can and what we can't eat we can" (консервиро­вать). 4) A curious tourist, after passing a huge field of tomatoes alongside the road stopped and asked the farmer what he did with these tomatoes. 5) He said they ate what they could and what they couldn't they could. A man inviting his friend to his home explained where he lived and how to get to his place. "Come to the 3d floor," he said, "and where you see the letter "E" on the door push the button with your elbow and when the door opens put your foot against it. "Why do I have to use my elbow and my foot?" asked his friend. "Well," exclaimed the man, " you are not going to come empty-handed, are you?" 1) It is an English custom to push the button with the elbow. 2) The man's name began with the letter "C". 3) The guest was surprised at his friend's instructions. 4) The guest knew why he had to put his foot against the door.